Grouse Point Kennels in Rice Lake, Wisconsin, is dedicated to breeding and hunting top quality, AKC and NAVHDA registered German Shorthaired Pointers. Grouse Point Kennels is a full service/full time gun dog training facility. We specialize in the pointing breeds and also work with retrieving and flushing breeds. We design a program around you and your dog and work with both to build you into the best team you can be. We offer Basic and Advanced training programs based around your needs. It is important to us that we are only breeding and hunting with the best dogs possible. All of our adult brood dogs have their hips certified. 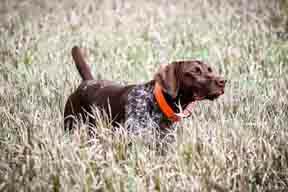 Grouse Point Kennels in Rice Lake, Wisconsin, is dedicated to breeding and hunting top quality, AKC and NAVHDA registered German Shorthaired Pointers. I am training for and testing in the NAVHDA and AKC testing programs for versatile hunting dogs. These tests are designed to prove the inherent abilities and the train-ability of your dog. I am breeding dogs that are proven to possess the traits and abilities that are required for hunting in the field and marsh.